We don’t think of guided travel as a business. We think of it as a great honor and privilege to be able to share what’s so wonderful about the world with our guests. Since it’s so personal for us, we treat each and every traveler as a valued friend. We want you to sit back and let us handle all the details so you can have the time of your life. We are always so excited when a past Collette guest chooses to let us show them another new place in the world. That kind of loyalty should be rewarded, so we offer a $150 credit every time you travel with us again. Save money and go on another adventure, just for sticking with us. 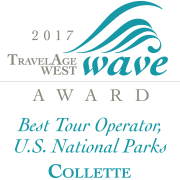 Join The Collette Passport Club! Getting to and from the airport can be the most stressful and difficult part of any trip. Start and end your adventure in hassle-free luxury with our private sedan that comes straight to your door, loads your bags and whisks you off to the airport and back home again when you return. Now that’s how to start and end a trip the right way.